Heeheeheeheeheehee. I saw that a bit ago and I still giggle when I see it. I even read the caption as if it were narrated by Attenborough (RIP). It's almost like the DRT bus that ended up in a ditch/ravine near the Whitby Mall. It makes me wonder, HOW did it get there? 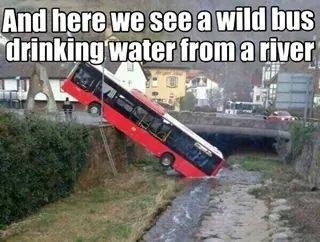 While typically a land dweller, the Omnibus Immoderatus cannot resist a refreshing drink after the high tide. Didn't publish your comment? Yeah. You're on the wrong website.